Heat a cast-iron dutch oven or heavy bottom stock pot with a lid on medium high heat. Add the cooking oil/fat and sauté the sausage that you removed from the links. Break it up into small chunks with a wooden spoon and allow it to brown slightly. When the sausage is browned, remove most of it from the pan reserving some of the cooking oil/fat in the pot and set the sausage aside. Sauté the onion in the cooking oil/fat until it is translucent. When the minced onion is cooked, add the sausage back to the pot. Add the garlic, chili flakes and cumin seeds and sauté with the sausage/onion until fragrant. When you smell the garlic and spices, add the beer, stewed tomatoes and stock and reduce just slightly. Add the mussels and remaining sausage and cover cooking vessel with lid. Steam the mussels on medium-high heat until they open, approximately 8-10 minutes. 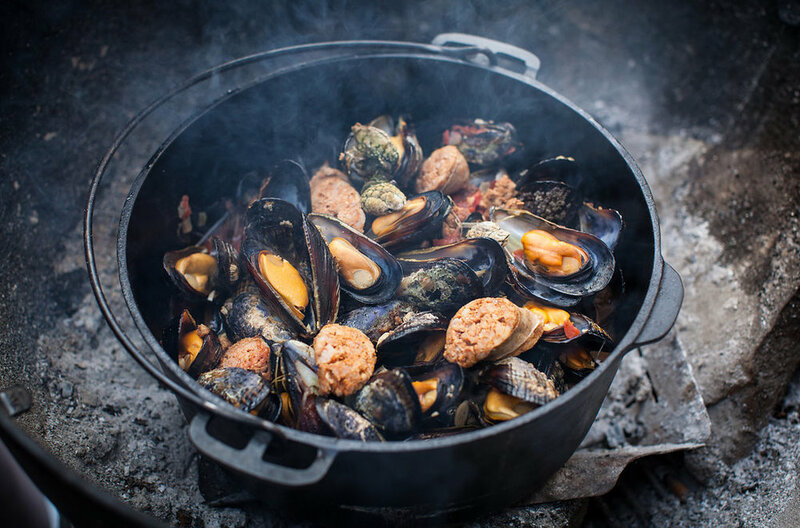 When the mussels are opened, using a slotted spoon transfer them to a large serving bowl and cover with a lid or plastic wrap to retain moisture while you finish the sauce. Using the released mussel liquor and tomato/chorizo infused broth that should still be in the cooking vessel, whisk the tomato paste and then the butter into the broth to enrich and thicken. Season to taste with sea salt and pepper. This will make a delicious sauce for the shellfish, so if you want more to go around feel free to add a bit more stock or even some water. Pour some of the sauce over the mussels and any remaining should be served on the side with the toasted bread. Garnish with the fresh herbs and a heavy drizzle of olive oil.